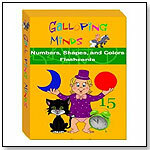 Galloping Minds Numbers, Shapes and Colors Flash Cards offer a way to teach and reinforce numbers, counting, shapes and color recognition for preschoolers. The flash cards have photographs and illustrations that offer an exciting and interactive way to acquire preschool skills. Each Flash Card is post-card size, has excellent quality photography, and is laminated to prevent damage from little fingers. Launch date: June 2009.